Hi all!! It’s time for 60L Weekend shopping! 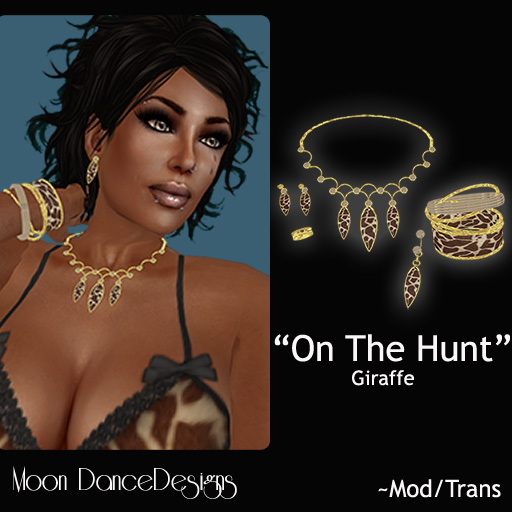 The “On the Hunt” Jewelry Set is a revision of the Leopard Set…and I’ll be releasing this set in all manner of animal prints! I’m also trying my hand at making clothing in SL, and I do hope you enjoy my attempts and most will have some type of matching jewelry pieces or accessories! The “On the Hunt” sets in Zebra are available for 60L Weekend. Also available this week is a cute tube tube and capri jean set in 4 different colors. 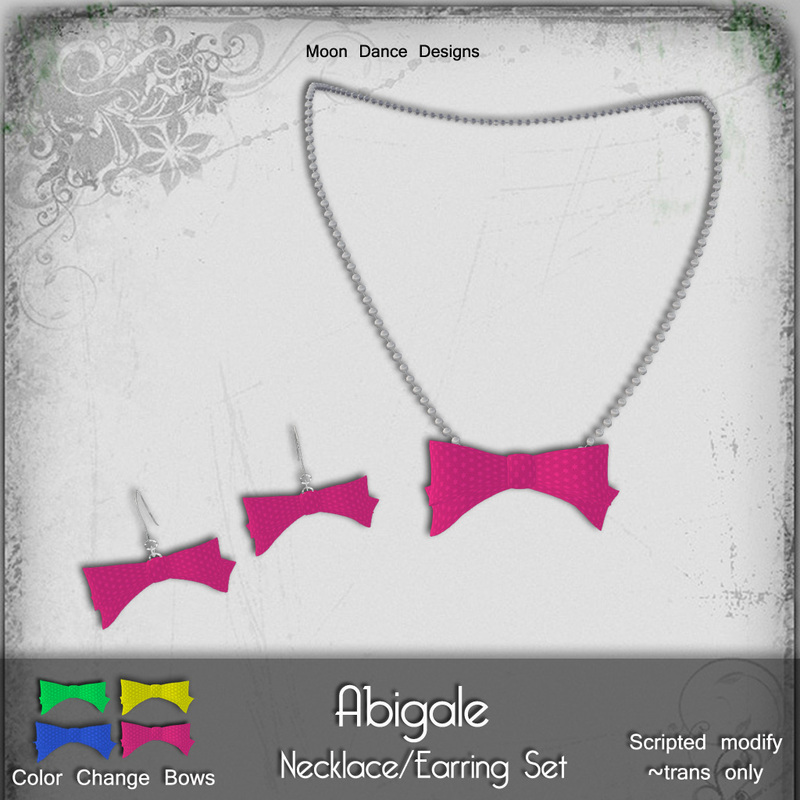 Simple matching jewelry is also available seperately, as well as thongs with matching bows! Hi all! A few new releases for your Summertime fun in the sun! The following NEW RELEASES and FREEBIE items are out for 60L Weekends (through Sunday, midnight) Only 60L each! My muse sure is enjoying the Summer, and it’s reflecting in my creations here in SL! This week is FLOWERS! Four creations with a bright and cheery sunflower. First is the necklace, with the sunflower centerpiece, chain and accents are gold. Matching earrings are available seperately. And of course, you have to have the tote to go around with the jewelry. 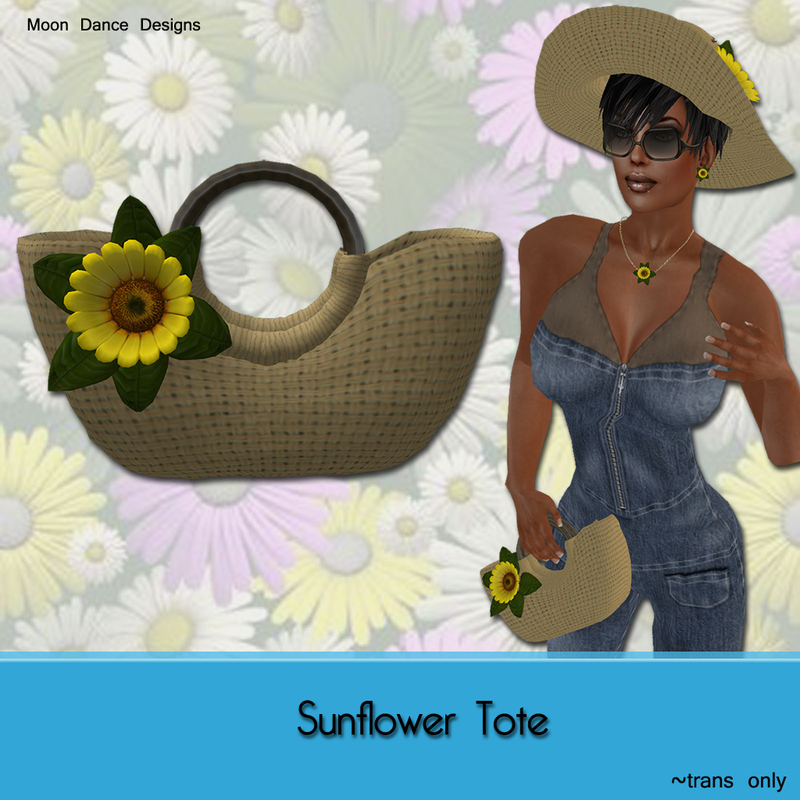 Simple straw tote adorned with a larger sunflower. And to keep you cool in the hot sun, a simple straw hat, again, adorned with a larger sunflower. Yours for FREE over the weekend! It’s all about Summer and Summertime fun! New releases this week are a pair of earrings and an anklet that are small replicas of the Gloria Eyewear set in pieces of jewelry! It’s almost summer where I am RL…and I thought I’d bring a bit of summertime fun to your SL! I have added another pair of leather flip flops, quilted leather with nautal suede soles. Perched atop the strap is an emerald cut stone. These sandals are texture change with 9 colors! The metal accents are also texture change with silver and gold. Matching the quilted leather thongs, I have created with the same matching textures, a small hand tote bag. 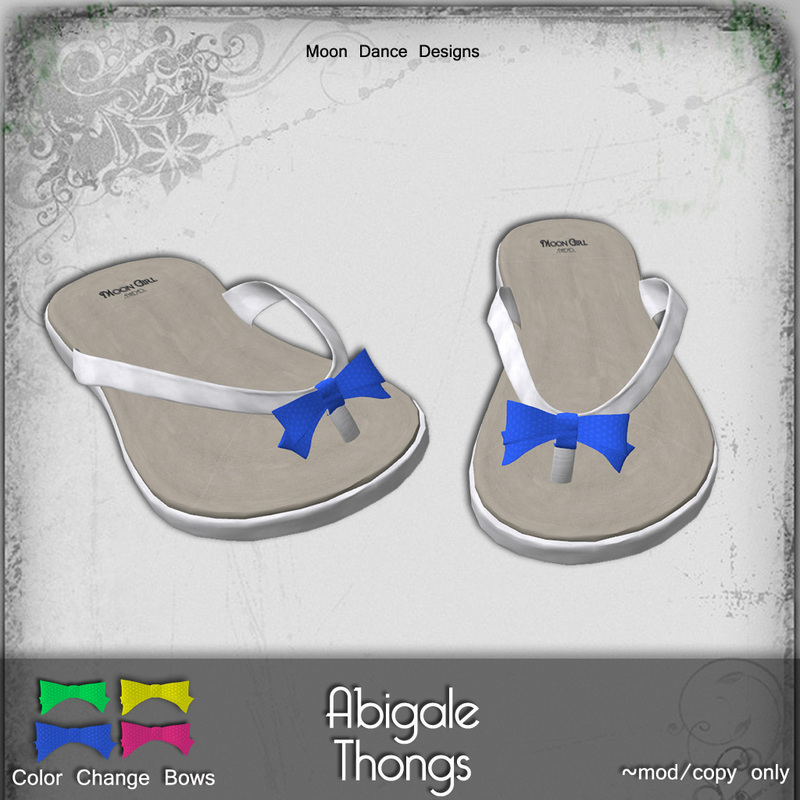 It is also accented with the same emerald cut stone as the leather thongs. 9 texture change as well as metals accents on the handbag. I have another tote bag as well, this one for the beach! You will find it filled with everything you need for a day on the beach. The tote is filled (decoration only) with a bamboo mat, tanning oil, sunglasses, a fashion magazine, bottle of water, and a mini MP3 player! And of course, you can’t do summer without sunglasses! I have created 4 different styles for your long summer days, each one scripted with many texture changes, and also color change for an endless combinations of colors! 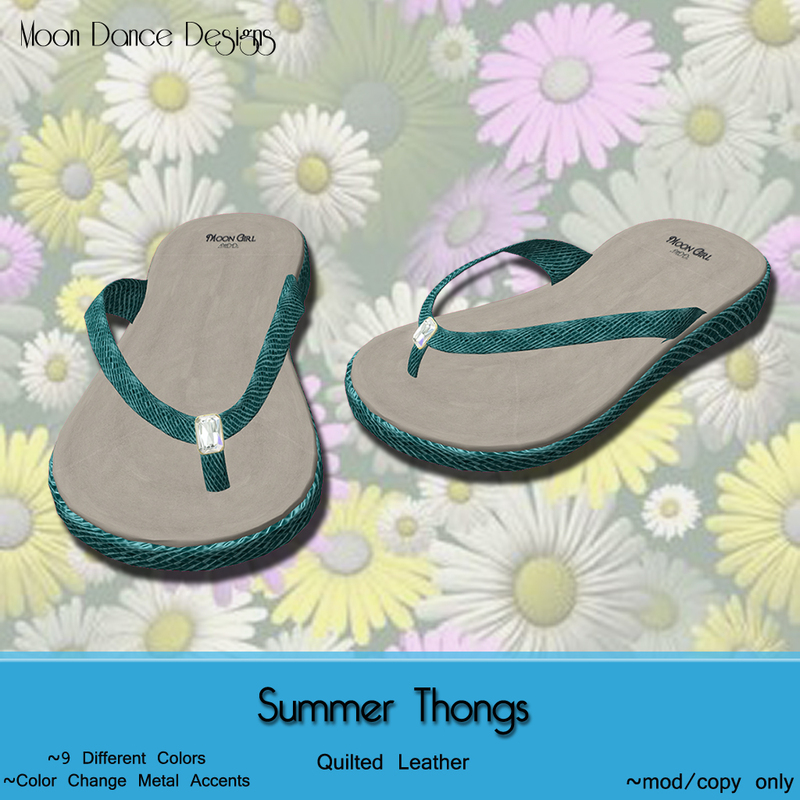 Look for more summertime goodies in up-coming releases!